We build a model of R&D-based growth in which the discovery of higher-quality products is governed by sequential stochastic innovation contests. We term the costly attempts of incumbent firms to safeguard the monopoly rents from their past innovations rent-protecting activities. 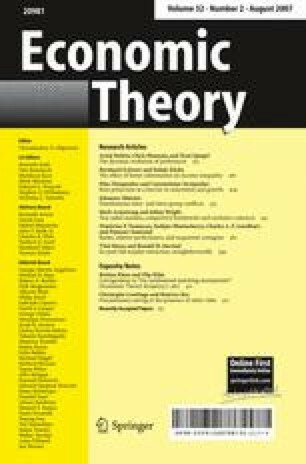 Our analysis (1) offers a novel explanation of the observation that the difficulty of conducting R&D has been increasing over time, (2) establishes the emergence of endogenous scale-invariant long-run innovation and growth, and (3) identifies a new structural barrier to innovation and growth. We also show that long-run growth depends positively on proportional R&D subsidies, the population growth rate, and the size of innovations, but negatively on the market interest rate and the effectiveness of rent-protecting activities. An unpublished version of this paper was circulated earlier under the title “Innovation and Rent Protection in the Theory of Schumpeterian Growth.” We thank an anonymous referee and seminar participants in several venues for useful comments and suggestions.